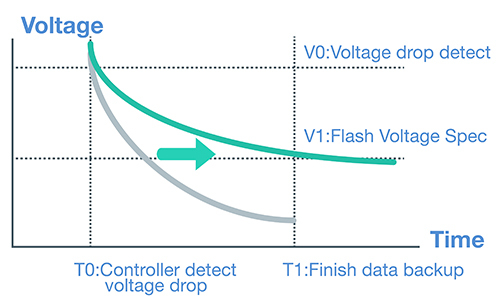 PLP (power loss protection) is a key technology associated with SSD reliability and is becoming widely adopted for improving overall system reliability by leveraging firmware and hardware to protect important data when encountering abnormal power spikes or outages. With improving technology, data integrity and protection may be sorted into two major approaches: the first is to retain several copies of important data and restore the last backup when the current data set becomes corrupted following an abnormal power shutdown. While this mechanism can ensure the integrity of important data, all data changes made from the last backup is lost. To solve this problem, the second method (used by ADATA) combines sensitive voltage monitors with banks of power-retaining capacitors. ADATA PLP technology supplies SSDs with enough power to continue buffered read-write operations until completion. Should power loss occur, the monitoring circuit detects the power drop and instructs the controller to back up all data in the buffer before power drains from capacitor banks. Using this method, all important data is saved, corruption-free. To ensure long term service, ADATA SSDs also incorporate S.M.A.R.T attributes to monitor drive health, including capacitors, and notify users well in advance of neede maintenace or replacement.